How about that! It’s a passenger jet flying over London, photographed from above. I’m reading another Robert Goddard novel and the hero is in Russell Square in London in 1911. 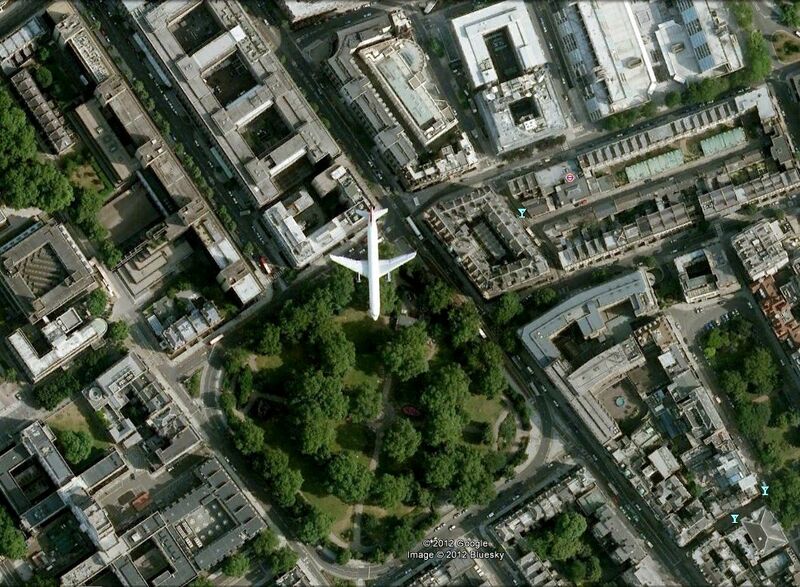 Where’s Russell Square?, I thought, so I looked it up, and there’s the plane. Just do the search yourself if you’re interested. Wow. Take a look at this if you like tricky graphics. Where I used to live, gone! 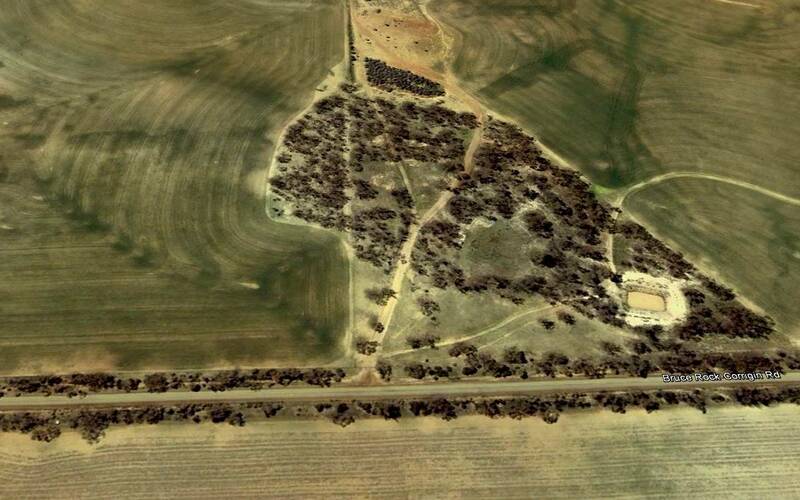 The photo above is the location, I’m pretty sure, where we used to live in an old weatherboard and corrugated-iron roofed house in the early 1950s. It was on the point where the wide sandy path in from the road meets the scrub. I used to walk down that track to the road and wait for the school bus to take me about 6Km in to Bruce Rock for primary school. It looks now as if nothing was ever there, yet there used to be a stone built shed among the outbuildings. House, sheds, all wiped away. Dad cleared a lot of those paddocks in the picture. He was only in his mid twenties and had never worked the land before. It was hard work. Oh, this unrelenting fine weather. Every day, cloudless blue skies, warm temperatures, no rain. Will it never end? Boring. That’s irony, folks. Saying something as a joke when you mean the opposite. But I’m not sure I do. In Britain, they’re getting worried because they’re in a bad drought. The forecast is no change for as long as next year. Amazing. Water restrictions, hose bans, crop failures, water courses and lakes drying up. That green and pleasant land could look like here soon. Now they’ll know what it’s like. C’est la vie. I’ve been thinking – every year this decade we’ve had a catchy date – 01/01/01; 02/02/02; …. 11/11/11 etc. This year, we’ll have 12/12/12. Then no more for a long time. We can’t have anything like 13/13/13 or any month like we’ve had this dodecade (12 years) for the rest of the century. Last century, we had 6/6/66; 7/7/77; 8/8/88; 9/9/99 – those are the ones I remember. I suppose we’ll have 2/2/22, 3/3/33 … to go on with. At least, you will. I should see the first, but I doubt I’ll see the second and subsequent. C’est la vie. I’ve just taken some boxer shorts out of the washing machine to the line, and a brand new pair, worn and washed once, has pulled a thread and virtually fallen apart. I have to buy these K-Mart shorts to get my size, but the quality is just going down and down. Made in Bangladesh now, and so flimsy you can see through the cotton. I had a choice of exactly two. I complained about the scarcity and they said, yes, we don’t have much stock, try Target. Big help. I may have to get a supply tailored for me in Bali! I got a letter yesterday marked O.H.M.S. * What’s this, I thought. Well, it was a nice note from the police with a speeding fine notice. There was my car in the picture, 47Km/h in a 40Km/h zone. First time in over 47 years of driving!! I can’t deny it … I remember it clearly. I saw the 40 school zone sign before I entered the roundabout but another car distracted me and I immediately forgot. Not a human being, let alone a child, in sight, mind you. $75 fine but no demerit points, thank goodness. These are the all time page views of my blog. Australia and Indonesia are no surprise (thanks, everyone), but from the map Google provides, one or more of my USA readers is in Alaska! To my friends in all those other countries, Hi, thanks for dropping in. * O.H.M.S. On Her Majesty’s Service! You gotta be kidding. This is the WA Police Department in 2012, still using the colonial letterhead. Get up to date guys. We’re not a republic yet, unfortunately, but we don’t tug forelocks to the queen any more, either.